The backstory to Carta’s third album is dominated by upsetting times with band members experiencing cancer, death, rehab and divorce within their family circles. Therefore the challenge for the San Francisco act is to create music which communicates grief, acceptance and eventual release in a sensitive and attractive way. Happily, there’s no concerns on that score. This is music which may be forever on the verge of attack (or occasionally on the cusp of joy and escape) but instead chooses to lurk in the shadows, exemplified by the album opener and title track, which evokes a languid, threatening undercurrent. ‘The Iowa Fight Song’ brings in a female guest vocal and rivals Piano Magic for glacial elegant misery whereas the rumbling menace of ‘The Hollow Greeting’ resembles Windsor For The Derby. The real genius of ‘The Faults Follow’, though, is the band’s ability to maintain interest with a varied and creative approach to conveying bleakness. Thus, even an instrumental like ‘Header’ makes perfect sense, thanks to its beautiful sleepy melody and what appears to be a typewriter sample. Further on, ambient ballad ‘Morse Code’ and a string-supported ‘Saragosa’ (another classy instrumental) captivate and delight whilst The Last Name Of Your First Love’ seduces with its chiming guitar figure and caressed percussion. It’s a rare trick to make slow to mid-paced music so compelling but ‘The Faults Follow’ reveals that all band members have the experience and the confidence to write an album which haunts long after the record has finished playing. 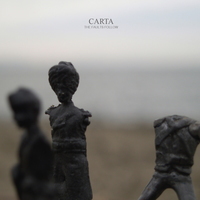 The title may set low expectations but Carta seem to be one of those acts who take their craft far too seriously to make any noticeable mistakes.